Good Visit with Stockmanship Friends! 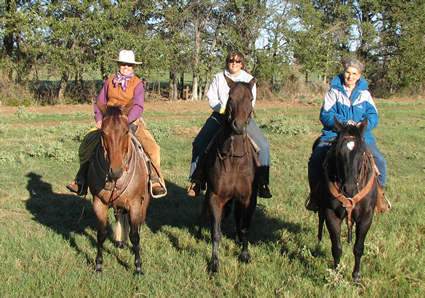 I just got back from a trip to Texas where I visited with Candi Cowden and Dawn Hnatow. Candi has just purchased a ranch a couple of hours NE of Dallas and plans on hosting Stockmanship Schools there in the future and asked if I would be willing to help them. Bud and I went to Candi’s Crane, TX ranch for the first time in 1990. She has hosted several Stockmanship Schools in Midland, TX (one of which is the basis for the Stockmanship-Plus video) and has attended several more. She is not only a good friend, but an excellent Stockmanship student. Dawn Hnatow is partnering with her on this venture. Dawn is well qualified to teach Stockmanship. She worked with Bud for nearly all of the eleven years we were in Alberta as well as a couple of years after we moved to Texas. I know there are many people teaching Bud’s methods. I haven’t seen any of their presentations so I don’t recommend any but Hand ‘n Hand Livestock Solutions (Richard McConnell and our daughter, Tina) but I am grateful for every one of them. There can’t be too many people preaching the gospel of Good Stockmanship.